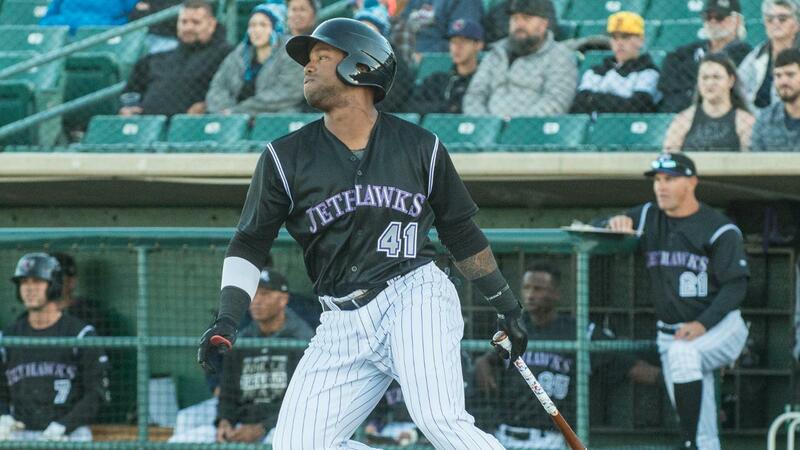 LANCASTER, Calif. - The Lancaster JetHawks came back to win game two of a doubleheader against the Lake Elsinore Storm Wednesday night, the team's first win of the season. Lake Elsinore won game one, 10-0, but the JetHawks took game two, 8-5. The Storm scored three runs in three different innings to run away from Lancaster (1-6). Luis Campusano got Lake Elsinore on the board with a two-run double in the first inning. That started a banner game for Lake Elsinore's catcher. He finished a triple shy of the cycle, going 4-for-5 with a home run and four runs batted in. The JetHawks fell behind but managed to fight back to win the nightcap Wednesday. Gabriel Arias hit a solo home run in the second and added a two-run double in the fourth to put the Storm on top, 3-0. It marked the sixth time in seven games that Lancaster's opponent has scored first this year. Hayden Roberts (1-0) pitched two innings in relief of spot-starter Nate Harris to earn the win. Tom Cosgrove, who was charged with Lancaster's first four runs, took the loss.